One of the largest dog breeds that exists, the Great Dane also has a big heart. This dog also known as a gentle giant, is a compassionate and affectionate companion. 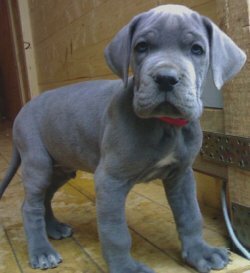 Great Danes are a very loyal breed, making them a wonderful guard dog for the family. This gentle dog loves children and enjoys the company of humans and other pets. The Great Dane is a family dog and adores being cared for like part of the family. They require a lot of cuddling and affection because they love attention and like to be the center of attention. The Great Dane is a unique breed with an interesting history. The breed has German ancestry, but it is also believed to have derived from a cross breed between the Irish Wolfhound and English mastiff. The true origin of the Great Dane breed has been a topic of controversy. Some people believe that the dog's origins have ties to Denmark instead. Great Danes have a large and powerful body frame, which has a square shaped body., including a square shaped head. Many Great Danes have cropped ears, meaning they are cut to be make them stand erect versus laying down in a natural form. The front legs of the dog are straight and the feet are rounded. The entire upper body of the dog is built for power and brawn. Great Danes have many different patterns of coat fur. The coat of a great Dane is short and smooth, and the hair is also very thick. The colors range from blue, black, mantle harlequin, brindle, fawn, and merle. The average height of a full grown make dog is roughly 30-34 inches tall, and 28-32 inches tall for female Great Danes. Being one of the largest dog breeds in the world, any dog could weigh up to the same weight as a full grown man. A male Great Dane weighs up to 200 pounds, and a female Great Dane can be up to 130 to 150 pounds, on average. Due to the large size of the dog, Great Danes usually live between 6 to 8 years. 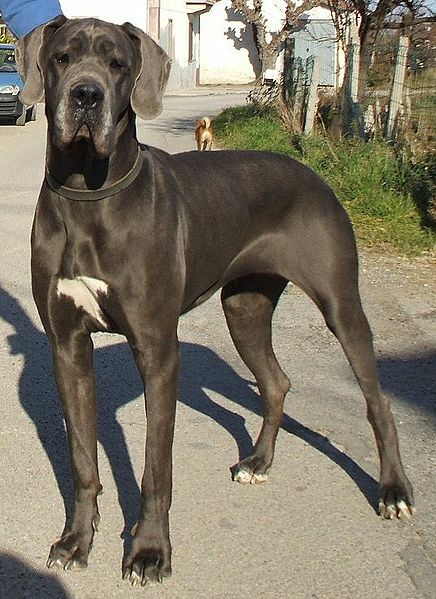 Since the Great Dane is such a large dog breed, they will need much more space to live than other types of dog breeds. An apartment can be a little tight for a great Dane since they need more space to walk and stretch so they do not get bored or feel constrained. Walking the dog is an absolute necessity because it helps the dog prevent medical issues prone to great Danes such as hip dysplasia. Walking is very important so when owning a great Dane, remember that long walks are needed everyday to ensure the best physical health for your dog. Since Great Danes are a large breed, they are more susceptible to bone and joint disorders. Dane puppies under the age of one year grow at such a rapid rate, that excessive walking or running can cause bone injury or accelerate the progression of joint problems. While exercise is important for dogs, Great Danes should never be allowed to run and jump for excessive periods of time because it can caused pain and injury to its bones and joints and cause a disorder called bloat. Bloat is a disorder that may be caused by trapping excess air inside the body cavity. The hair on a Great Dane is very smooth and short, so brushing with a firm bristle brush is best, and only bathe when necessary. The short hair on the dog makes it easy to maintain, and the hair sheds at an average rate. Flea and disease prevention is very important in order to fully protect your dog from any outdoor invaders. It is mandatory to protect your dog if you take your dog outdoors ever, and every dog owner takes their dogs outside! Therefore, protecting their coat and skin is a good way to prevent diseases from entering the dogs system. Great Danes are often known to have health problems that are common among larger breeds. One of the common problems includes gastric dilatation-volvulus, or GDV. This is basically a condition in which the dog's stomach distends and twists. Certain precautions and practices can help prevent what could be a deadly condition. Having an elevated food dish is believed to help prevent this sickness. Others believe that minimizing exercise just before or immediately meals can also reduce the risk for GDV. Common signs of GDV may include an enlarged abdomen and frequent gagging noises without producing vomit. Since Great Danes are so susceptible to certain ailments, it is important to take your dog to the veterinarian on a regular basis. Speak to your vet about specific ways in which you can either extend your dog's life, or prevent it from becoming ill.